Surely Boris Johnson’s Mendacity Is Best Suited With David Cameron & The EU Remain Scam! 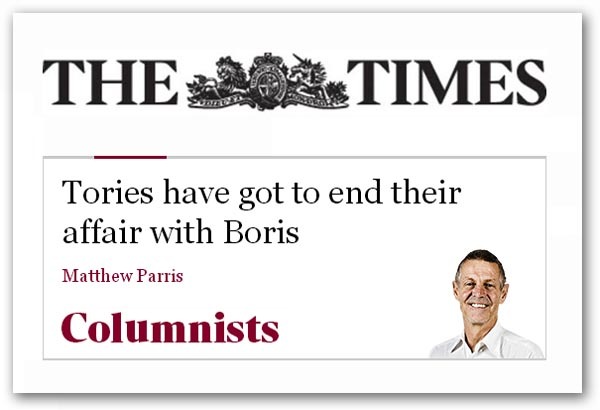 No sooner had we published our own piece on Boris Johnson yesterday, branding him a “sociopath” and a “serial liar”, when up came a piece in The Times by Matthew Parris, headed “Tories have got to end their affair with Boris”. Before discussing this article, and others which have since been published, it is interesting to note that, in July 2007, Poly Toynbee was writing in the Guardian of Boris Johnson. Then, nearly nine years ago, she was calling him, “the jester, toff, serial liar and sociopath”. Despite him being even then a prominent person, Toynbee could do so without any fear of legal action. And nor has there been any. Yet, in any other circumstance, deliberately to call a public figure a “serial liar and sociopath” would invite terrible retribution through the courts, ending up in costs and damages which could bankrupt all but the richest. In his current piece, Parris goes further, noting of the man generally, that there’s a pattern to his life. It isn’t the lust for office, or for applause, or for susceptible women, that mark out this pattern in red warning ink, he says. “It’s the casual dishonesty, the cruelty, the betrayal; and, beneath the betrayal, the emptiness of real ambition: the ambition to do anything useful with office once it is attained”. To talk of a man’s “casual dishonesty”, his “cruelty”, and his “betrayal” is, in today’s cautious media, quite extraordinary. That Parris can address it to a man who hopes (or so we are told) to seek the leadership of the Conservative Party and then the post of prime minister – and who is currently pitched to become “Mr Brexit”, the face of the “leave” campaign in the EU referendum – is almost beyond belief. Yet, so well recorded are Mr Johnson’s lies – the subject of newspaper and magazine articles and even books – that no one would dispute them, least of all Mr Johnson himself. Even now, though, he retains his popularity and his defenders, and any number of otherwise quite sensible people are prepared to argue that, in the interests of unity and an effective “leave” campaign, we should not criticise the man, Rather, we should get behind him, and support him, desisting from calling him “silly names” like “serial liar”. We get this from people who rail against the dishonesty and corruption of the EU, and of the venality of dishonourable, mendacious politicians. Such is the magic of “Boris” though, is that they are prepared to be represented by this lying, scheming, thoroughly dishonourable politician, and one who isn’t even master of his brief – to the extent that he makes unforced, and unnecessary errors. That has to say something not only about Boris Johnson, but about our society – where a man so dishonourable that he should be shunned as a pariah – is applauded and fêted by decent men and women, who welcome the idea of being led by him, and are willing to forgive his many and repeated transgressions. Says Parris, his “charm can make us forget the dishonesty and recklessness”, but he then makes the salient point that this would be “ruthlessly exposed if he became leader”. Frankly, I don’t care about that. Before we get there, we have a referendum to fight, and in his expected role of “Mr Brexit”, his dishonesty and his incompetence will also be “ruthlessly exposed”, putting us on the back foot, spending time an effort – as we are doing now – having to deal with this charlatan, instead of devoting our energies to fighting the enemy. Johnson survives by turning everything into a joke, with the public schoolboy “cripes” or “bonkers”, and a boyish grin that is supposed to represent his charm. But somebody has to call a halt to the gathering pretence that if only you’re sufficiently comical in politics you can laugh everything off, says Parris. Somebody has to remind us that it’s not enough for those who seek to govern us simply to be: they have to do. In a damning section, Parris then spells it out. Incompetence is not funny, he writes. Policy vacuum is not funny. Administrative sloth is not funny. Breaking promises is not funny. A careless disregard for the truth is not funny. Advising old mates planning to beat somebody up is not funny. Abortions and gagging orders are not funny. Creeping ambition in a jester’s cap is not funny. Vacuity posing as merriment, cynicism posing as savviness, a wink and smile covering for betrayal… these things are not funny. Steadily, almost imperceptibly, an absurd idea has crept upon us. Had it been ventured nine years ago when the Tories desperately sought a candidate for the London mayoralty, it would have met a hollow laugh. Since then nothing that’s happened adds to its plausibility. Much has occurred to rob it of any plausibility it ever had. Yet still the idea has grown: shrewdly, assiduously, flamboyantly puffed by its only conceivable beneficiary, Parris says. “Where else in politics can such self-validating, self-inflating nonsense be found? It isn’t – believe me, it really isn’t – that Britain could ever want Boris Johnson as prime minister. Travel north of Watford and you’ll abandon that thought. It is that the Conservative party could have the effrontery even to ask us to”. Parris says he feels uncomfortable writing this about a fellow columnist, his former Spectator editor, an essentially liberal-minded fellow Tory, a wonderful entertainer, and a man who has never been anything but friendly towards him. Scores of media colleagues would say something similar of Boris, would feel the same discomfort, the same sneaking affection, the same restraining instinct to keep quiet… which perhaps explains the silence. He feels uncomfortable too about touching upon sexual impropriety, of which he’s certainly had his own share, and which (if sexual indiscretion alone disqualified a person from political office) would disqualify some of the best. And he hesitates to condemn a man for political ambition. But Parris is doing the right thing. It is this conspiracy of silence amongst journalists, who are so quick to report his comings and goings, but who are so slow to report on and remind us of just how ghastly this man really is. It’s this willingness that we saw with the Mail to turn the truth on its head when it comes to reporting on the man, the platform given by the Telegraph who took on this liar after he had got himself fired from The Times for the most heinous crime of all in journalism – falsifying a story. Since then, Johnson has been falsifying stories for a living, systematically lying to his readers, part of the pattern to which Parris refers. He does not name two of the women he impregnated, one of whom had an abortion and a miscarriage (she had believed he would marry her); the other bearing his child; and the Court of Appeal judge, refusing a “gagging order” in 2013 to conceal her existence, remarking that the public had a right to know about what he called Johnson’s “reckless” behaviour. With other details of his disreputable career, mentioned, Parris asks: “Have we forgotten all this?” And one could well ask. Are our lives so empty of meaning, and so lacking in moral grounding that we are prepared to forget the sins of this man because he makes us laugh, or because he is entertaining? Parris refers us then to the Treasury select committee, where he invites us to see for ourselves the “blustering, bantering hole in the air”. Watch him, says Parris, “refusing to admit that his Telegraph claims, that the EU has banned the recycling of teabags and the inflation of balloons by children, were simply false. Watch a portrait-in-miniature of Johnson the politician: under-prepared, jolly, sly, dishonest and unapologetic but (and this is the worrying part) horrifyingly vulnerable”. And that is a key issue. Even if you are willing to tolerate the disgusting immorality of this man, it is he who exposes us to ridicule as the “remains” exploit his inconsistencies, his blustering and his profound ignorance about the EU. Parris is then concerned about the effect of Mr Johnson on the Conservative Party, concerned that he will fail under the intense scrutiny that goes with candidates for prime minister. But I’m only concerned with the damage he has already done to the “leave” campaign and the damage he will continue to do as long as he is seen to represent us. The Conservatives stand, as it were, looking across apparently open country towards Mount Boris, says Parris. He beckons, and they do not see the great canyon between them and the prize: an abyss into which any electoral adventure would tumble. The abyss is Mr Johnson’s public and private record. We don’t seem to see it, yet it stares at us from yellowing newspaper print, from an insuppressible internet, from the public record, from judicial statements, from colleagues’ judgments, from everything we know or ought to know but have been persuaded, such is his charm, to brush aside and forget. It is all there, waiting. When the media turn nasty, as it will, his powers of laughing everything off will falter. And for that reason Parris warns that Conservatives “should end our affair with this dangerous charmer”. More immediately, though, that “dangerous charmer” will wreck out chances of winning the referendum. The “leave” campaigners should end their grotesque admiration for this serial liar, who can do us no good at all. And, to illustrate quite how dangerous Johnson is to the cause, no sooner had Parris finished than Nick Cohen in the Observer took over, calling him a “liar” and a “conman”. No one who has studied him, says Cohen, thinks he is telling the truth when he says he believes that it is in our best interests to leave the European Union. The reason why he must deceive reveals Johnson’s low character as clearly as his casual mendacity. He was as big a success as Brussels correspondent of the Telegraph, where he exhibited the vices of the worst columnists by confirming rather than challenging his readers’ prejudices. In that time and in that place, pandering to Telegraphreaders meant producing alleged stories about insane EU bureaucrats, none of which colleagues on rival papers could confirm. Any man with a functioning sense of shame would have worried about his long record of supporting the EU. As late as February, Johnson was saying that leaving would embroil “the government for several years in a fiddly process of negotiating new arrangements, so diverting energy from the real problems of this country”. And so it would. Elsewhere he acknowledged that we would not get free trade without accepting EU regulation and immigration. Any man of honour would have been mortified by the pathetic figure Johnson cut at the Treasury select committee last week. Bombastic and evasive, he gave a shifty smirk every time MPs caught him out. “A good liar needs a good memory”, we used to say. Johnson’s appearance at the committee showed he didn’t even have the conman’s basic ability to memorise a cover story. I am not one for blaming the media, says Cohen, but I cannot think of a politician who has been treated with such woozy indulgence by my supposedly hardbitten colleagues. They have bought his persona as a lovable card, and ignored the emptiness beneath. Britain may pay the price, he says. Johnson’s career has seen him embrace the worst of every profession he has entered: the worst of journalistic mendacity, the worst of celebrity entitlement, and the worst of political ambition without political purpose. But there is no reason why the “leave” campaign should pay any price for having this ghastly man foisted upon us. We didn’t ask for him, we don’t want him, and the sooner we are rid of him the better. Anybody who thinks otherwise needs to look hard and deep at themselves, and ask why it is they even consider themselves opposed to the EU. If they can tolerate Johnson, the EU should present them with no problems at all. Previous Previous post: For Trump read Boris Johnson or it could equally be Kardasian or Price! Next Next post: Boris Johnson, Politics & the Media have Much In Common As They Lie For A living!